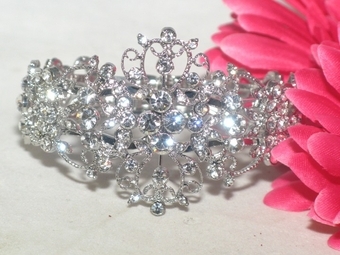 Elegant Crystal Romance Vintage Bridal Bracelet - SALE!!! HOME / BRIDAL JEWELRY / Wedding Bracelets / Elegant Crystal Romance Vintage Bridal Bracelet - SALE!!! Description: Amazing Vintage bangle syle Romance Crystal Bracelet. The design and fit is amazing, you will absolutely love it. Measures approx 6 3/4"